Get it? Because they're all short. Because much of the pre-season concern has been directed toward the defensive line and it's lack of proven contributors and depth, people have forgotten just how dire the wide receiver position is. Yes, Roy Roundtree had a great season in 2010 catching wide open passes that safeties gave up because of the threat of Denard's legs. Unfortunately, his hype came crashing back to the ground last year when he became That Dude That Lined Up Across From Junior Hemingway. After catching 72 passes for 935 yards in 2010, Roundtree caught only 19 passes (!!!!) for 355 yards last year. Great receivers find ways to get open and Roundtree just couldn't do that lsat year. An offense with Roundtree as the #1 receiver will have trouble in the passing game. His ceiling is Jason Avant, but I'm not sure that Roundtree has the athleticism to make the league. You might remember Jeremy Gallon from his Houdini act against Notre Dame last year that set up the final touchdown pass to (hey!) Roundtree. Otherwise, Gallon was a nondescript slot receiver who ended up the second leading receiver on the team (31 receptions, 453 yards, 3 TDs). The concern for this year is not that these guys can't catch. They're both sure-handed, underneath receivers with the ability to make defenders miss and gain yards after the catch. The problem is that Al Borges' offensive system emphasizes downfield routes and putting stress on a defense by stretching them vertically (maybe this will force Borges' hand with bubble screens). None of Michigan's returning receivers have the speed or size to scare any secondaries this year. The fear isn't that Denard will continue to heave balls into double coverage as Roundtree and Gallon get out-leapt and out-muscled for passes. It's watching these guys struggle to get separation from defensive backs and Denard being forced to make pin-point throws underneath, something he's capable of doing but not particularly consistently. If you look at the names of the backups and think to yourself "Oh, those were all of the sleeper prospects that we haven't heard anything from the last few years" you're probably right, except for Wes Welker Drew Dileo. Dileo saw spot duty during Rodriguez's final year and caught a handful of balls last year. He's white and short, so people will naturally compare him to Wes Welker. Because that's reductive, suffice it to say that Dileo, though lacking in elite speed, has sure hands and can be relied on as a third-option. When Michigan has three- and four-wide sets on the field, Dileo will be out there. Otherwise, he'll probably spend most of his time on special teams. Jeremy Jackson, son of running backs coach Fred Jackson, enters his third year as a slender (6'3", 204 lbs on the official site) outside receiver who has effectively zero on-field experience. Last year, Jackson caught only three balls during the season. He doesn't have top end speed or strength, but might be just tall enough to be a downfield threat. Jackson's development will go a long way toward this unit's effectiveness. If he proves to be contributor early in the season, that would give Michigan a legitimate outside threat with Roundtree and Gallon left to try and pick apart defenses underneath. This is a big "if" but there really aren't many other options. The only others on the roster will be Jerald Robinson, a 6'1", 215 lbs redshirt sophomore who hasn't seen the field in his two years; true freshman Amara Darboh, a four-star outside type with offers from Florida, Michigan State, Nebraska, Wisconsin, and Notre Dame; and fellow true freshman Jehu Chesson who you can find out more about from MGoBlog. Long story short: Michigan's worst position on either side of the ball this year--barring tight ends, which will spend all season blocking and will be covered with the offensive linemen tomorrow--will be wide receiver. If you don't recognize the picture on the right, chances are you follow recruiting less than I do, which, if you're reading this blog, is unlikely. 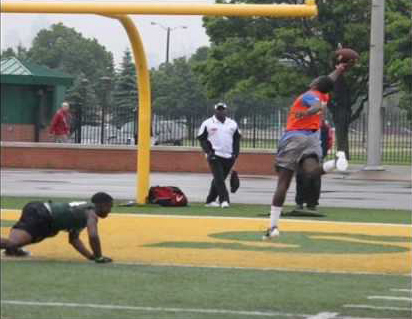 That's Devin Gardner snagging a pass at a camp event during his senior year. He got so bored dominating everyone at quarterback, that he began taking reps as a wide receiver. Since Denard became a world-beater in 2010, the wheels in everyone's heads began turning. Wide receiver. Holy smokes, Michigan desperately needs these. While most people are centering their concern on the offensive and defensive lines (and rightfully so, about which more later), wide receiver is nearly as barren as the linemen depth chart. If this game doesn't turn up the volume on the Gardner-to-WR chatter, nothing will. I didn't take note of everyone out there (did Roundtree even play in the game? ), but regardless, Michigan has no one to catch passes that will threaten opposing defenses. Michigan desperately needs to bolster its wide receiver corps and after yet another unremarkable year as a backup and lackluster spring game, Gardner-to-wide receiver only makes sense. With no chance that Shane Morris decommits from Michigan before the 2013 season, Hoke and Borges will finally have the pocket passer that they need to run their system. Gardner hasn't shown any signs of being the kind of quarterback that Borges needs: his mechanics seem beyond repair, his throws are inconsistent at best, and he still struggles to read defenses. The reason to keep Gardner at QB rests on one question: If/when Denard gets injured will the team be noticeably better with Gardner under center than with Russell Bellomy? In my opinion, no. This is not to say that Bellomy is as good of a quarterback as Gardner, but if Denard goes down, this becomes Fitz Toussaint's team, regardless of who is taking snaps. Wasting Gardner's athleticism on the bench when Denard needs a legitimate deep threat to throw to is the kind of bet hedging that I don't expect Hoke to take part in. Next year, this is Shane Morris' team. By that point, the roster will start to fill up with legitimate outside threats at wide receiver, at which point, you can move Gardner back to QB for depth. But this year, his talents are needed on the outside. I think the coaches are smart enough to realize this and won't waste Denard's final year with sub-par personnel. Gardner spending the year at wide receiver (which I fully expect him to, FWIW) is the only hope for this offense to take any noticeable step forward. While Denard will show some natural progression during his second year in Borges' system, without adequate weapons, his performance will likely be stuck in neutral. Gardner can fill and possibly surpass the threat and production that Junior Hemingway brought last year. Good news he will play at WR and with his height he will be this years Junior Hemingway. Go Blue!!!!! !